Tek-Ninja: Cloze Pro: More than just an assessment tool! Cloze Pro: More than just an assessment tool! So the good folks at Crick Software bill their software Cloze Pro as a "unique assessment tool". And it is, to be sure, but it is much more than that as well. For those not familiar, Cloze Pro is software that allows you to either type or cut and paste any digital text into it. Once your text is in place, you can systematically remove specific words or every 3rd, 4th, 5th, etc word and replace it with a blank. The removed word then appears in a Word Wall. 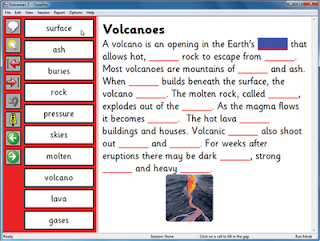 Your student then reads the text and clicks on the appropriate blank to choose the right word. In addition to text, you can include pictures. 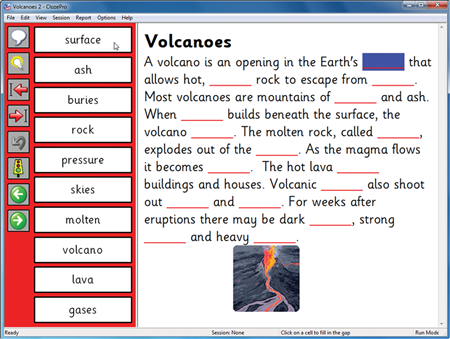 After finishing, the software will generate a report indicating how many answers were correct, a list of what was incorrect, and how many Cloze Pro Clues the student used. You can easily click a "restart" button, and re-administer. I have been using Cloze Pro with a few mid to high performing high school students with Autism who struggle with handwriting. These students have tried many alternative writing tools including voice dictation and word prediction software but they were unsuccessful with these other tools. When the Assistive Tech team was called in initially these students were receiving all their class notes scribed by Teacher Assistants. They were supposed to than go home and read the notes to study. Not a bad solution, but not great either. With Cloze Pro, the Teacher's Aid is able to take the Teacher's lecture note, and past that into Cloze Pro, and remove key words to the word wall. Now instead of just listening and studying notes which they had no part in generating, the students follow along with the lecture, filling in the blanks for their lecture notes. Close Pro is made for both Mac and Windows. A single user license is $199.00. You can find more information at www.cricksoft.com. Make Your Mac Talk Back! Why Won't the School Give my Child an iPad!?!?! Thanks to the Public School Foundation! Paper: a fantastic new drawing app! WATI continues to provide amazing resources!